The CB Cash Code claims you can easily start making $80,000 per month using this system. But is CB Cash Code a scam, or does it really know a secret website that can help you earn this kind of money? The answer to this is a little complicated, as you, in theory, can make money on the “secret” website it talks about. But there are A LOT of things you are not told. In this CB Cash Code review I will show you all the details about what you can really expect, and show you some important warning signs, so you know what you are getting into before investing any money. The CB Cash Code will give you a bit of training about how to make money with ClickBank. But not something you should expect to help you make the kind of money the sales page claims. The program has sooo many warning signs – you for example do not know who the owner is, it uses fake testimonials, it uses very exaggerated claims, and much more. It is therefore NOT a program I recommend. What is CB Cash Code and what does it offer? CB Cash Code is a system that is supposed to teach you about a secret website, where you can easily earn up to $80,000 per month. You are told that to make this kind of money, you do not need any special skills. All you need is an internet connection and 10 minutes per day. All you apparently need to become rich online is internet and 10 minutes per day. You are even told it is so easy that even the owner’s 77 year old grandmother can do it. You are just not told much about how you will actually make money, and what it will teach you other than the secret website is called ClickBank. As a member, you will get access to some training material and PDFs to read that is supposed to help you learn how to use ClickBank to make this kind of money. However, in my opinion, you should NOT expect this kind of superficial training to be able to get you started with earning easy money online. To make any kind of money online you need in-depth info which CB Cash Code is not providing in my opinion. In addition to this, there are so many warning signs, when it comes to this system and the claims it makes. A system with this many warning signs and BS tricks is one I would personally stay away from. But more about these warning signs later. Let’s first go over what ClickBank actually is, and if it is even a real way to make money online. Can you make money on ClickBank? As I already mentioned in the intro, you can, in theory, make money with the secret website the CB Cash Code will teach you about. It is definitely possible to make good money by joining ClickBank. It is a platform where you can earn money through affiliate marketing by promoting other peoples’ products and earn commissions like this. Affiliate marketing is definitely a legit and real way to make money – I know this from personal experience, as I make money on several websites like this myself. However, already in the sales video when you are told about this “secret” website, there is a lot of BS in my opinion. You are for example told that almost nobody knows about this website. The “secret” website is really not a big secret. This is just a way to make you feel like you are told a secret and make you feel special, as it is more likely you will then buy. More or less anyone working with internet marketing knows about ClickBank, so it is not really secret. This does however mean that the CB Cash Code is right about the possibilities of making money with ClickBank. 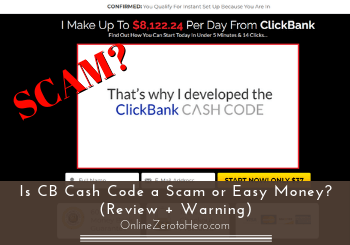 If you decide to try to make money through this platform, you however just have to be aware that there are not only good products there – there are also many ClickBank scams. You can potentially end up promoting products that in my opinion will not give people any real value and that is just meant to try to lure money out of people. In addition to this, CB Cash Code is definitely not the best place to learn to make money through ClickBank or learn affiliate marketing in general. Not only will you in my opinion not get training that is thorough enough, but the system also has a lot of warning signs and things you are not told. I have already mentioned a few warning signs and things you, in my opinion, have to be careful about when it comes to CB Cash Code. Who the owner is, tells a lot about a program. This is something that is always good to look into before investing in any program that claims to help you make money online. The supposed owner of CB Cash Code is George Patterson. There is no proof of who the owner is. You are also told a sad story about how he could not pay the medical bills for his mother, until one day he suddenly got help from a friend that told him about ClickBank and how to use it. This does however not prove anything. It is a very normal approach for programs like this that claims you can become rich very easily by buying their program. You are just told a name and a sad story, and how they then suddenly learned the secret to make fast money online. Now they then want to help others and do not want to charge much for this (which is NOT true, as I will show you later). There is however no proof at all that this story and the name of the owner is even true. When you hear these stories form a program without any real proof of who the owner is, it is, in my opinion, a big warning sign. If it really was such a great product, would the owner then not be happy to show himself and prove he is a real person? So you do not alone not know who the owner is. You are also showed fake testimonials. There are several video testimonials in the CB Cash Code presentation video. They are however bought testimonials and not from real users. For example the testimonial from the woman that claims she makes a lot of money with CB Cash Code by just working 10 minutes per day. 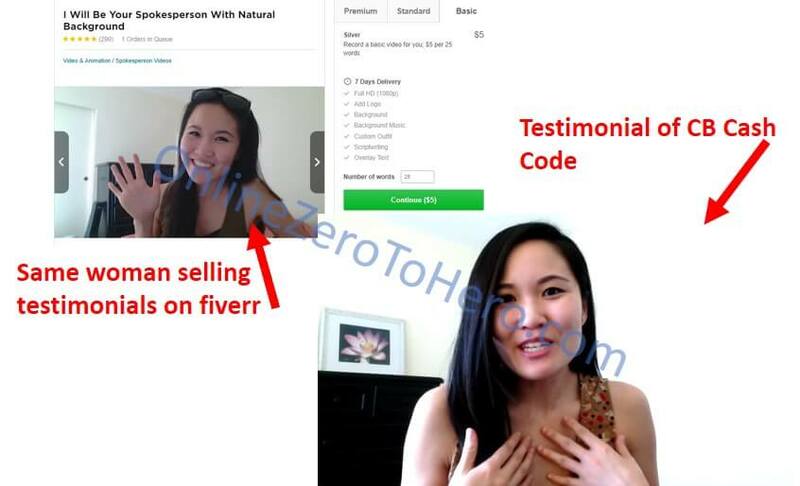 She is actually just selling testimonials on fiverr.